So, this weekend we had some hot weather and the damage from that heat is apparent in all kinds of plants. Sycamores, cottonwoods and willow in the Santa Clara River bottom look torched. Redwoods in the landscape look like a new disease has hit them. Even old coast live oak in Ojai have been toasted. Orchards have been hit also with been hit without exception. This has been a widespread weather phenomenon like a major freeze. And the trees should be treated as if they have been freeze damaged. So, what to do with the avocados and citrus that have been hit? Well, if it's just a slight toasting, nothing. They will grow out of it. It's a setback. The growing points, the terminal buds, have been damaged and in the case of avocados those may not flower next spring. If the damage is not extensive, the whole canopy has not been damaged, then flowering should be sufficient for a good crop next year. If the whole canopy has been hit, it's likely that flowering will be minimal next year. 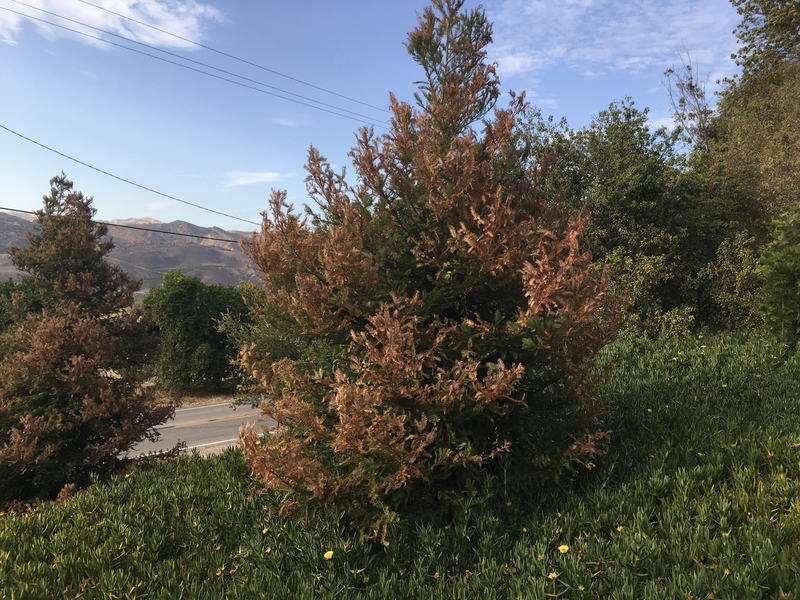 If the trees have lost significant portions of the canopy, though, the heat damage is not the problem, it's the sunburn damage that is going to happen that is the problem. It's the loss of the leaves that transpire and cool the tree that lead to this kind of damage that can kill small trees and lead to significant branch loss in older trees. The leaves act like the radiator in a car. They move water through the tree and that water movement carries off the heat that accumulates in the branches and stems. When water flow stops, the bark heats up and tissue is damaged. The worst-case scenario occurs when a “renovated” tree that has been brought down to 6 feet in January and since then there has been new growth all over the tree. The heat fries that new growth and now the whole tree structure is exposed to sunburn damage. The branches exposed to the sun need to be protected with whitewash. The whitewash needs to be WHITE, not grey. It needs to be able to reflect the sun and prevent the surface from heating. The tops of branches and the west and south sides need to be the most protected, so it often involved hand work. And it needs to be done soon after the canopy loss. That wood heats up fast and damage occurs soon after it heats up. So what else needs to be done? No canopy, no water loss, so it's necessary to manage the water differently. With no leaves, there is no water moving from soil through the tree, so it just sits there, and the ground stays wet. Perfect conditions for root rot. Growers who were watering their trees knowing that a heat spell was coming, did the right thing. It probably reduced the severity of the damage, but even growers who had water on before the heat and it was running during the heat have had damage. 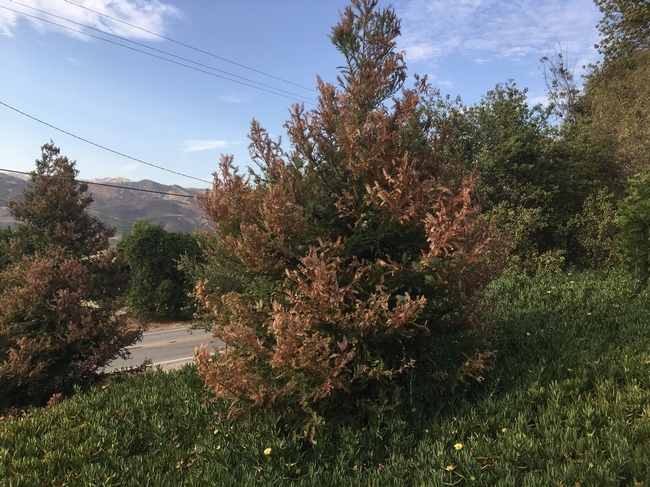 With canopy damage and loss, applied water needs to be restricted to just enough to get tree recovery without creating a wet, soggy condition. And with tree recovery, it's going to need a continually changing irrigation schedule as new growth occurs. So now more than ever, water to the tree's growing needs. And the normal fertilizer program needs to be adjusted. There's probably sufficient nutrients in the soil from prior fertilization that nothing new needs to be applied. And don't' prune the trees. Leave the hanging leaves there. They will help protect the tree from sunburn, but the extent of the damage is not clear. Let the tree push new growth and that will tell you sometime in the future 3-6 months, even a year from this event, when to do significant pruning. Phlood, Phyre, Phrost, Fytophthora and Phahrenheit continue to plague our industry. It seems like we are always coping with some natural and some unnatural issues affecting agriculture. Oh, yeah and pH. Photo: Heat singed new avocado growth. - provides financial assistance to producers of non-insurable crops when low yields, loss of inventory, or prevented planting occur due to natural disasters including excessive wind and qualifying drought (includes native grass for grazing). Eligible producers must have purchased NAP coverage for 2017 crops. A notice of loss must be filed within 15 calendar days of when the loss is apparent or 15 calendar days after the normal harvest date. - offers payments to eligible producers for livestock death losses in excess of normal mortality due to adverse weather. Eligible losses may include those determined by FSA to have been caused by hurricanes, floods, blizzards, wildfires, tropical storms, tornados lightning, extreme heat, and extreme cold. Producers will be required to provide verifiable documentation of death losses resulting from an eligible adverse weather event and must submit a notice of loss to their local FSA office within 30 calendar days of when the loss of livestock is apparent. – provides assistance to eligible orchardists and nursery tree growers for qualifying tree, shrub and vine losses due to natural disasters including excessive wind and qualifying drought. - provides emergency relief for losses due to feed or water shortages, disease, adverse weather, or other conditions, which are not adequately addressed by other disaster programs. ELAP covers physically damaged or destroyed livestock feed that was purchased or mechanically harvested forage or feedstuffs intended for use as feed for the producer's eligible livestock. In order to be considered eligible, harvested forage must be baled; forage that is only cut, raked or windrowed is not eligible. ELAP also covers up to 150 lost grazing days in instances when a producer has been forced to remove livestock from a grazing pasture due to wildfire and for beekeepers, ELAP covers beehive losses (the physical structure) in instances where the hive has been destroyed by a natural disaster including flooding, high winds and tornadoes. Producers must submit a notice of loss to their local FSA office within 30 calendar days of when the loss is apparent. – available to producers with agriculture operations located in a county under a primary or contiguous Presidential or Secretarial disaster designation. These low interest loans help producers recover from production and physical losses. - provides emergency funding for farmers and ranchers to rehabilitate land severely damaged by natural disasters; includes fence loss. - is an Internet-based Hay and Grazing Net Ad Service allowing farmers and ranchers to share ‘Need Hay' ads and ‘Have Hay' ads online. Farmers also can use another feature to post advertisements for grazing land, specifically ads announcing the availability of grazing land or ads requesting a need for land to graze. www.fsa.usda.gov/haynet. For more information on these programs, visit FSA online at www.fsa.usda.gov. After a Fire, Replant or Topwork? After the fires, the question has come up of whether an orchard should be replanted or topworked in the field, possibly to a new variety. This has been an issue in the past and was addressed in a little study nearly 20 years ago. The study still bears relevance today and applies to both avocado and citrus. 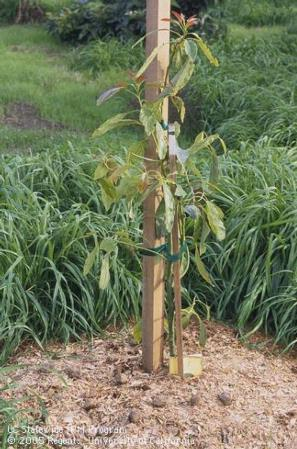 The availability of avocado trees for replanting is in serious short supply, so replanting may not be an option at this point. There are many changes going on in the citrus industry and one opportunity is the conversion of an orchard to another variety of citrus. If this is a consideration, then the question becomes one of whether the orchard should be topworked or replanted with new nursery trees. If the trees are healthy and under 20 years of age (it is possible to topwork older trees) and the new scion is compatible with the interstock or rootstock, then topworking can come into production sooner than a new replant. If the planting density needs to be changed or serious soil preparation or a new irrigation system needs to be installed, then replanting might be the preferred choice. The chance to convert is also dependent on the availability of new trees and budwood. New varieties can often be in short supply. It's best to make sure that for either option that the material is there. For topworking, T-budding is more conservative of material than stick grafting. If topworking is chosen, then it must be decided whether to graft the scaffold branches or the stump. Stump grafting makes for a lower tree, but scaffold grafting reduces the risk of losing the topworked tree from damage to the graft from birds, pests, wind or frost. It is often assumed that topworking is cheaper than replanting, but as the following example shows, it probably is not. In Santa Paula, ‘Olinda' Valencias on ‘Carrizo' rootstock were converted to scions ‘Allen' Eureka lemon, or ‘Powell' late navel. In 1998 and 2000, the ‘Olinda's were interplanted with either ‘Allen' on ‘Macrophylla' or late navel ‘Powell' or ‘Chislett' (on either ‘Carrizo or ‘C-35' rootstocks). The ‘Olinda's were topworked in 2002 and 2003 to one of the new scions. In a few cases, ‘Allen' was stump grafted, but most trees were scaffold grafted. • Get a reputable person to do the work. • Time of year is critical for grafting. Spring is best. • Leave a nurse limb. • Decide to stump or scaffold graft. o Scaffold grafting requires 2 buds per scaffold. Consider winds since even one-year old unions are very tender. o Remove bags when shoots start growing through them. Much of this work can be contracted with the grafter, who usually assures some level of performance, something like 90% take. It is up to the grower to ensure that pests do not take out the grafts. The costs of topworking are associated with the costs of the budwood (as much as $3 per tree), the act of grafting (depending on stump or scaffold, $8-10 per tree) and water sprout removal. Sprout removal is six times in year one, eight times in year two and only four times in year three. At a labor rate of $12 per hour, sprout removal costs $7.20 per tree. A like for like comparison of topworking versus replanting based on 2002 data is shown below. So in the case of both the lemon and navels it costs a bit more to topwork, but the results are earlier production. Here the topworked trees gain the economic advantage. For example, if cultural costs were $1000 per acre per year (20 by 20 ft. spacing) and, conservatively, two years are saved, the maintenance savings per tree would be $18. In the above study the time advantage appears even greater. Three-year old topworked lemons produce about the same as 6-year old replants. Two year old topworked navels have a significantly larger canopy than six-year old replant navels and appear to have about the same fruit set for the coming year. The very fact that avocados can be grown in hard to get to places means that the trees are also in areas that are subject to wildfire damage. 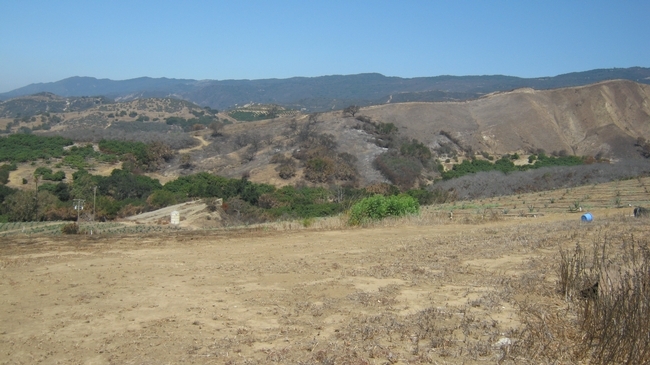 Recently several hundred acres of avocado burned in the foothills. The fire was fanned by high winds and low humidity. 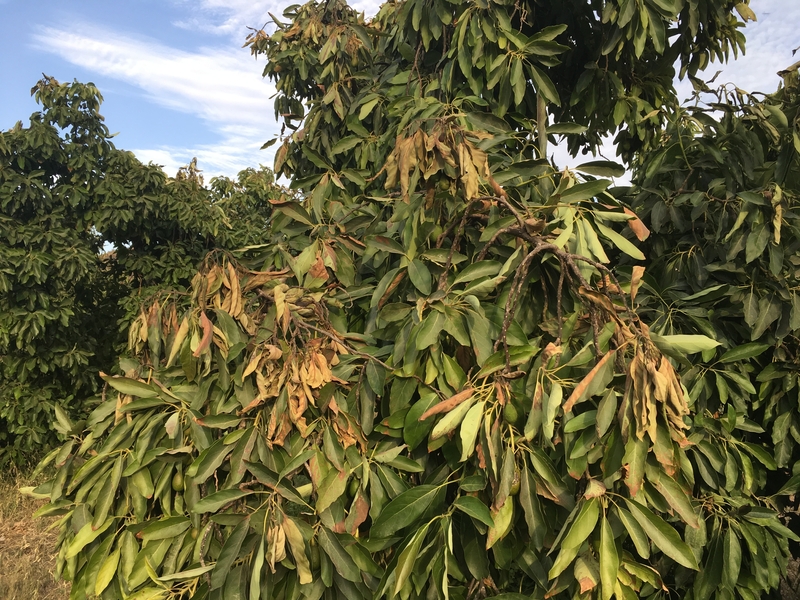 Every year there are avocado trees that burn, either through careless attention to early morning fires that pickers build, wildfires or car accidents. A grower needs to be patient and observant to bring the trees back into production. 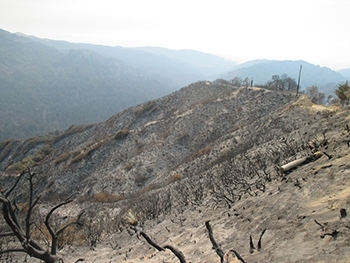 Although injury to foliage and young growth is visible within a few days of the fire, the full extent of the damage may not be known for several months or possibly the next growing season. In the case of severe injury, die-back may continue to occur for several months after the fire. New growth that occurs after the fire may suddenly collapse the following year when the growth is tested by Santa Ana conditions. The important rule to follow after a fire is to do nothing - don't prune, don't fertilize and maybe don't water. Or rather, water very carefully. Dry winds may have sucked the water out of the ground and may need to be replenished. The fire may have burned the irrigation lines and need to be replaced. In the meantime, if the tree has been defoliated by the fire, it has lost its ability to transpire water. Watering a tree with no leaves will set up those conditions that are conducive to root rot. Until the tree begins to leaf out, watch soil moisture to decide how much water the trees are pulling out of the soil. The emitters should be capped or plugged on some leafless trees. Then as the tree puts on new growth, shallow, infrequent irrigations should start. This may mean replacing the 10 gph microsprinkler with a 1 gph dripper if only a portion of the orchard has been burned and the rest of the trees need their usual amounts and frequency of water. The avocado has a tremendous ability to come back from fire and frost damage. However, the tree will tell you where it is coming back. It will start pushing growth where the tree is still healthy. It may take 3 to 6 months for this growth to occur. 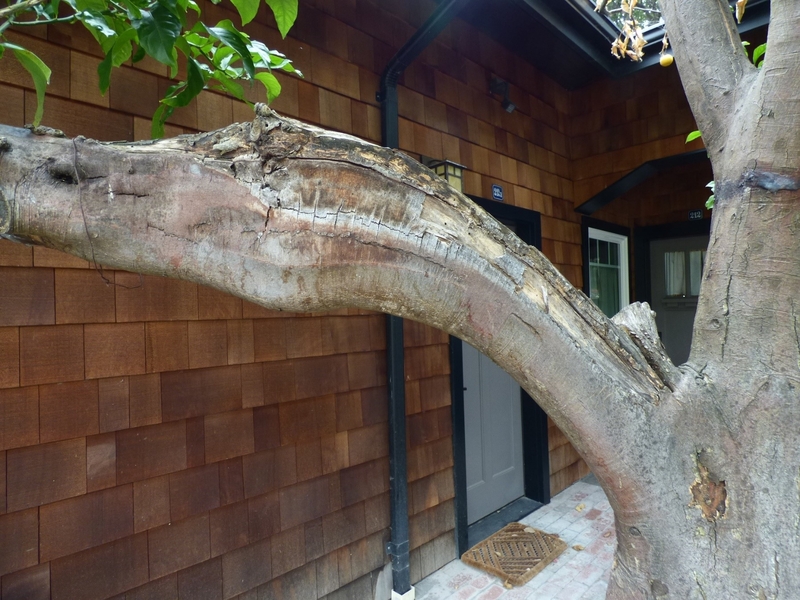 Delay pruning until the tree clearly shows where it is going to regrow. By waiting, you save the expense of having to return sometime later to remove more wood and also will be able to save the maximum about of tree. An activity the grower can perform is whitewashing. The defoliated tree can be further damaged by sunburn after it has lost its protective cover of leaves. The upper surface of horizontal limbs and the south sides of exposed trunks are the most affected. The whitewash can delay the appearance of new growth, but it does not affect total growth. There is usually no value in applying the whitewash to small limbs. There are various commercial whitewashes on the market. The easiest to prepare is the cheapest white latex paint on the market mixed with water to the extent that it will go through a sprayer. 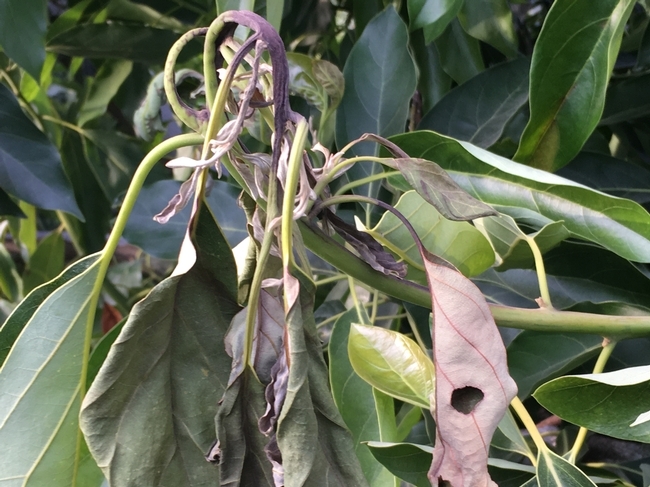 Avocado trees have a great ability to recover after fire damage. Even trees killed below the bud union will frequently develop into good trees if they are rebudded and given good care. Trees which do not put out vigorous sprouts should be removed. Interplanting avocados would rarely be advisable because of their rapid recovery. Avocado is a tree that has a good ability to respond to fire damage, if it is not too extensive. However, often a tree will recover only to collapse later on in the year or years because of the damage. So a tree may appear to do well and then suddenly collapse. In an orchard setting, fire damage can kill one tree completely, whereas the one just beside it recovers completely. This poses a major problem with irrigation management. How to irrigate the slowly regenerating tree that gradually needs more water, less frequently, next to trees that are recovering at a different rate or not at all. This becomes a management nightmare. 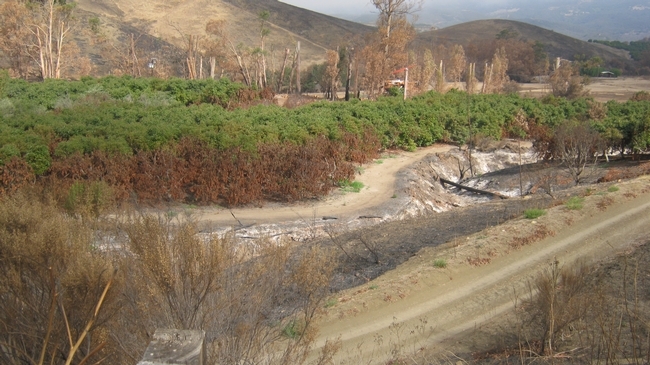 Often the result of the difficulty of water management, the remaining trees develop root rot and they eventually die from that and not the original fire damage. There is a general rule of thumb I have learned and used – when more than 50% of the trees have succumbed, it is best to replace the whole orchard. This is due to the issues of irrigation management and the loss of return from the unused portion of the grove. So, from a pure economic management aspect, where there is any fire damage, that area should be considered a loss. If you look at your aerial survey and just measure the areas that show fire damage and take that as a proportion of the total planted area, you should be able to assess the extent of the damage incurred in the fire. So measuring the brown areas relative to green should give you a good assessment of the damage incurred in the fire. It may be possible to nurse back individual trees with a lot of attention and if it's a small enough area, go ahead. But on commercial scale of acres, it often doesn't pay from a management point of view to nurse the orchard to an economic production level.